Rapid advancement in life sciences research is typically driven by technology that maximizes assay speed and throughput. The explosion in genomics research created by widespread adoption of next-generation sequencing (NGS) technology is just one example. Many laboratories are realizing significant gains in efficiency, thanks to automated liquid-handling technology that delivers accurate and precise dispensing of volumes in the nanoliter range. The popularity of modular systems that can be linked together indicates that researchers require flexibility as well as speed. Researchers are turning to automation for a variety of reasons. “Frankly, people who spend 6–10 years to get an advanced degree don’t want to get stuck pipetting at the bench,” says Holger Pils, business unit leader at Hamilton Robotics. “They want to work with their brains, not with their hands.” Pils observes that automation frees up time for other duties—such as writing papers, giving talks, or designing the next experiment. Automation can add value to even the smallest laboratories, adds Alisa Jackson, senior global marketing manager, genomic solutions, Beckman Coulter Life Sciences. According to Jackson, the demand for automation is expanding to universities and many clinical research organizations. Most laboratory procedures that require dispensing and mixing of liquids are amenable to automation. Jackson notes that Beckman customers are automating many common procedures, such as PCR and qPCR, nucleic acid purification, and both Sanger and next-generation sequencing. The benefits of automation are especially evident in labor-intensive procedures such as immunoassays. “We also see growing numbers of researchers with interest in automating DNA cloning methods for synthetic biology applications,” observes Jeremy Lambert, director of automation and liquid handling, PerkinElmer. The PerkinElmer JANUS® NGS Express™ liquid handling workstation automates key procedures in sample-preparation workflow for benchtop, next-generation DNA sequencing platforms. It is capable of preparing up to 24 sequencing libraries. Plate-based procedures such as qPCR, immunoassays, and cell-based assays were among the first to be automated. While most laboratories take the first step in automated liquid handling—using multichannel pipettors—their needs soon outgrow this stage. Lambert recommends that scientists consider both current and future needs for throughput and workflow. An ideal system will be flexible enough to work in both plate- and tube-based formats, and should scale from low- to high-throughput requirements. Thermo Scientific’s Versette system, available in 96- and 384-well formats, is targeted to customers “who perform plate replications, plate reformatting, and serial dilutions,” says Tuula Jernstrom, product manager. For larger-scale customers, Thermo Scientific also offers the Multidrop line of plate dispensers that can deliver liquid volumes from 50 nL to 2.5 mL in 6- to 1,536-well formats. The Beckman Coulter Life Sciences Biomek 4000 Laboratory Automation Workstation comes with icon-driven software with ready-to-use applica-tion methods including PCR setup, PCR cleanup, and cell staining. Flexibility is also a key design consideration for Agilent’s Bravo systems, especially for researchers designing qPCR experiments or immunoassays. “The Bravo has interchangeable pipetting heads, enabling the researcher to switch easily between 96 and 384 pipetting channels,” states Kathleen Shelton, senior director of marketing. Cell-based assays come with their own set of challenges. One of these challenge, insists Dr. Buhlmann, is contamination: “The avoidance of any contamination—by mycoplasma, fungi, other cells or ingredients—is a major factor when handling cells during seeding or drug addition and incubation.” Eppendorf’s epMotion systems are easy to clean, can work with HEPA filters, and can be decontaminated with UV light. Pipetting tools can also be autoclaved. “Hamilton’s liquid handlers use high-performance, air-displacement pipetting technology, similar to electronic handheld pipettes that are commonly used for sterile cell culture work,” says Kristina Klette, Ph.D., business unit manager, automated cell biology solutions, Hamilton Robotics.This feature eliminates the need for system liquids and self-contained liquid channels, thereby greatly lowering the risk for contamination of cultures or assay plates. Hamilton also offers containment solutions that integrate with liquid-handling systems to ensure a sterile workspace within the pipetting area. 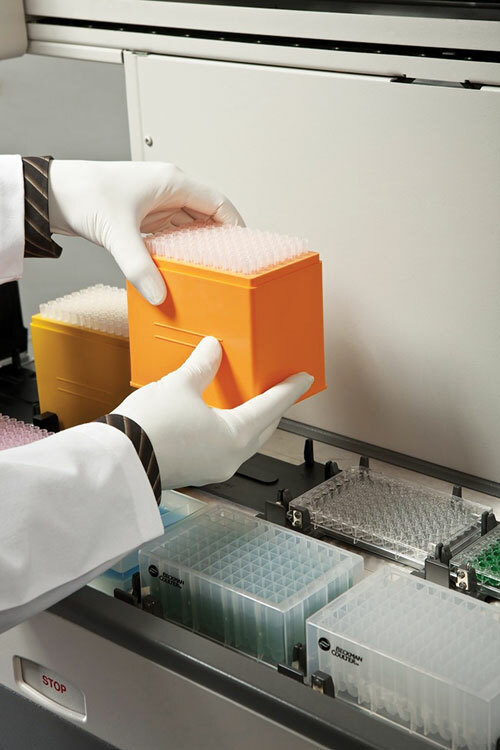 The Agilent AssayMAP Bravo platform and protein purification cartridges constitute an automated solution for high-throughput protein sample preparation and purification. It is designed to enable quick, precise, and highly parallel microscale purification of target antibodies. Microarrays are still a popular choice for many laboratories seeking economical, high-throughput solutions for genotyping, gene expression, or epigenetic studies. For these laboratories, automating the multiple washing and hybridization steps of a typical microarray workflow can save time and money. For researchers who wish to automate the often tedious steps of microarray target labeling, Beckman offers specially configured Biomek systems, designed in collaboration with Affymetrix. 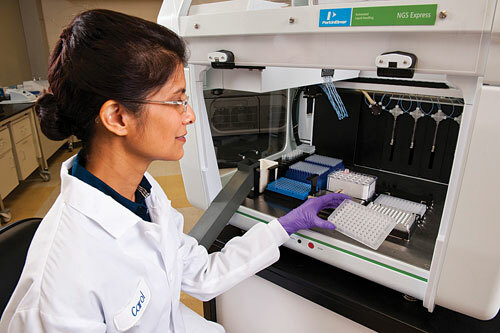 Agilent provides automated sample-labeling workstations for its own line of comparative genomic hybridization (CGH) arrays. Dr. Liao emphasizes that these capabilities are essential for library normalization and “cherry picking” for confirmation of hits or secondary screening. Hamilton’s systems also allow for pipetting directly from Illumina-provided reagent vials, which avoids transferring precious reagents to sequencing reagent plates and minimizes associated losses. Researchers considering automation can be daunted by the variety of options available. However, all major manufacturers make it easy—and affordable—to start with a smaller system and expand as the laboratory’s needs grow. 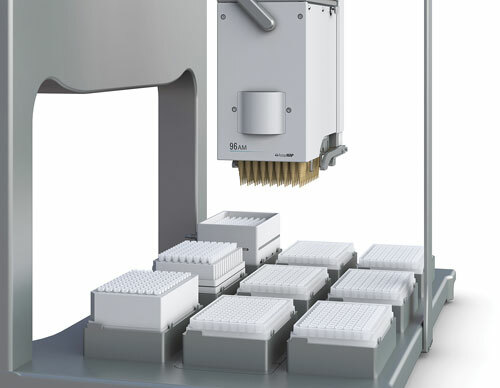 For example, the Thermo Scientific RapidStak plate stacker can be connected to its core automation system, the Multidrop reagent dispenser, which can, in turn, interface with an Orbitor plate mover. “Other integration-capable elements—barcode readers, dispensers, washers, readers, imagers, and the KingFisher Flex magnetic particle system—create a partial or complete workflow solution that addresses the customer’s current needs, but provides both expansion and change of workflow capabilities,” asserts Dean Mulyk, product manager, laboratory automation. Agilent’s scalable automation capabilities are best illustrated by its workflow for NGS sample prep. “Researchers can start with a standard Bravo instrument, containing the needed heating blocks, magnetic beads, and shaking stations,” says Shelton. Adding a BenchCel robot provides automated plate-feeding capabilities. If the laboratory’s needs grow even further, Shelton recommends using the existing platform as the foundation for building a customized workstation—for example, by adding a robot with an articulating arm to increase throughput and decrease hands-on time. For successful automation, software and hardware must play well together. “More and more, the main users of robotic workstations are biologists and chemists, rather than automation engineers,” explains Shelton. Selecting a system with a user interface geared toward scientists and specific to the assay being performed increases user satisfaction with the overall system. Thermo Scientific’s LIMS also provides functionality for storing and recording instrument maintenance requirements, including calibration records and personnel training records. This feature can be especially helpful for laboratories that need detailed reports for regulatory agencies or customer audits. Beckman provides similar options with its Data Acquisition and Reporting Tool (DART), which captures and stores all data generated during a sample run, including process information, sample identifiers, and analytical data barcodes. It also offers SAMI process-management software (SPMS) for more specialized needs. “Specifically, this software was developed for processes that take days or weeks to complete, such as cell-line development,” explains Jackson. Modularity is as important for software as it is for hardware. Herbst cites the example of Lonza’s endotoxin detection assays that integrate with its WinKQCL Endotoxin Detection and Analysis Software. This software package integrates with Tecan’s Freedom EVOware automation software. “The learning curve is easier than using two pieces of software independently,” says Herbst. Future developments in automated liquid handling will be guided by an increase in the demand for miniaturization and the ability to handle smaller volumes more efficiently, according to Jernstrom. Beckman is closely following new technologies that are breaking into the sample- preparation market and could effectively disrupt traditional automation. “Much of this is driven by the market desire to move many research processes and tools to the highly regulated clinic,” says Jackson. She cites increasing needs for microfluidic sample preparation, single-cell analysis, and large-volume blood assays as key factors driving development.